Shown here is a lighted Gazing Ball. Horizon Art Glass will travel anywhere to complete our work to your specifications. Built on quality craftsmanship and continued customer satisfaction, Horizon Art Glass is the place for all your custom stained glass, handcrafted beveled glass, wooden doors, full entries, and leaded glass needs. 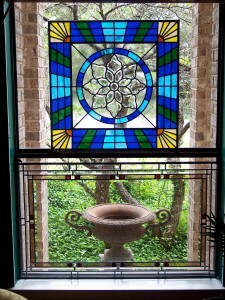 We are a custom stained glass studio serving the Pasadena area for over 25 years. We can create the design for or you can bring in your own design. If you need help in color selection of glass or architectural glass we can show you samples and help guide you in the right direction. There is a large selection of already beveled glass groupings from large to small groupings. We also have custom beveling available. If you need triple glazing leaded glass we can also service your needs. 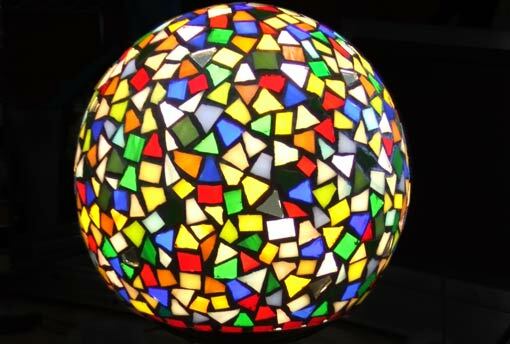 Ready for immediate purchase are custom mosaic garden birdbaths and gazing balls, plus other small glass items. We use the finest quality of materials and can do some repairs or restorations. There is a 50% deposit required on all jobs and the balance due at completion. We accept cash, check and credit cards. Depending on the window it may take one to two weeks to complete. Estimates are free. Please call to make sure someone is at the shop as sometimes we may be out in the field doing an installation. We can travel anywhere in the country for custom jobs in new construction or remodeling. Let us design a new leaded art glass panel to fit your existing door. We have two locations, San Antonio TX, and Pasadena, CA, however, we can travel anywhere in the country for custom jobs in new construction or remodeling.